Widening of Sarjapur Road was put on hold because of the delay in land acquisition, and people refusing to take Transferable Development Rights (TDR) as an alternative to money for their land. The problem here lies in the Karnataka Town and Country Planning (Benefits of Development Rights) Rules, 2016. TDR or Transfer of Development rights is a big non-starter in Municipalities like Bengaluru, given the loopholes. First of all, TDR providing 2X compensation in FAR won’t solve the problem as people holding rights are not able to get fair value or even sell it due to lack of demand. Real Estates or builders who are the biggest beneficiaries don’t see much value in purchase of Floor Area Ratios (FAR). Today violation of FAR is at its peak. BBMP has no pragmatic solution, and until it really puts a cost for additional FAR upgrade, this will not find any takers. Outside of this, there is no real TDR exchange/bank or an authority that can validate, issue and certify these trades just like a stock exchange. The value has to come from the market with some upward limit policy, which isn’t the case today. Fraud certificates, lack of proper records and delay in processing of genuine cases has all contributed to TDR being a non-starter for months. This has also reduced the credibility of TDRs. The policy is non-transparent and sometimes irrational. Any infrastructure development right from drains work, pavements, road widening, rehabilitation of slum dwellers, metro, junction upgrades or building even bus bays needs land. 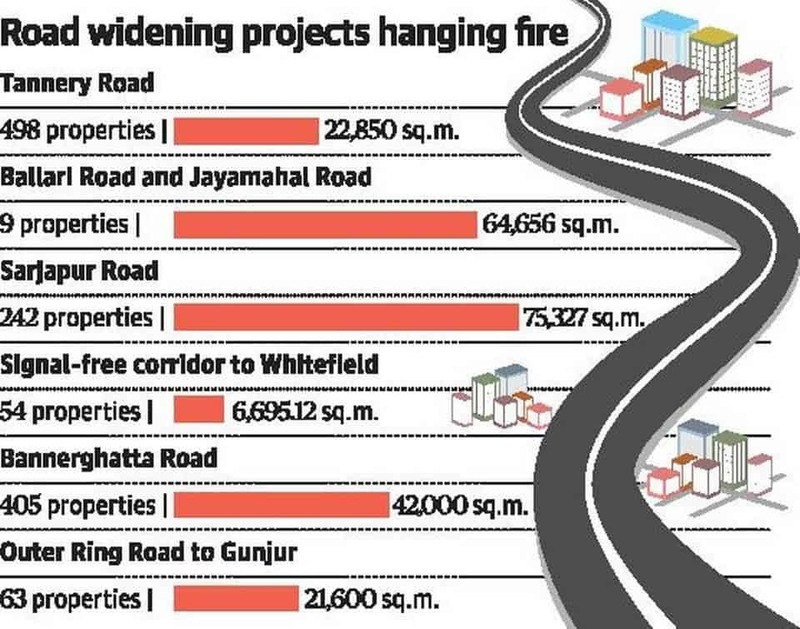 A simple view on the state of Bengaluru’s infrastructure projects in 2018 shows how they are all non-starter announcements remaining just on paper, or going at snail’s pace due to land acquisition hurdles. Today many are asking to solve problem through Land Acquisition Act 2013 and pay a monetary compensation because of all the above credibility issues in TDR system. However, the State government doesn’t have the financial strength or a robust policy to solve any of the issues. Below are some of the ideas which I believe can help address this issue. We need TDR bank/exchange with single regulatory authority to monitor, authenticate and enable market trading of development certificates issued – this enables better value for sellers and option for real estate developers through legal platform; government can place a upward limit on auction value by zone to avoid misuse and artificial pricing of such certificates. A clear service-level agreement based process for documentation, issuance of developmental right certificates for interested parties – delays only make matters worse. Before rolling out any FAR-based rewards, give some credibility to FAR. If everyone adds more FAR illegally, gets away without major price then the value system of FAR rewards is of no use. Akrama Sakrama is also one such act on the anvil to regularise FAR violations. We need technology like urban analytics and drone mapping in the auditing of FAR and flag non-compliance using a citizen audit system. Better FAR based on zones – like FAR of 3 in MG Road and 2.25 in Bellandur. Make a flexible policy for this by zones with revised upward limit that can be determined based on project prioritisation. A detailed DPR done should also make such recommendation based on a set of flagged priorities of the project. E.g. New York runs with double digit FAR compared to here. As we don’t have many options, can we at least leverage the compensation policy from Land Acquisition Act 2013 and have an interim state TDR revision that is in alignment with the compensation of 2X+ for acquisition with additional value based on rural or urban section. Further, make the process SLA-driven with one authority managing this. In the long run, It would be better to amend the act as per the 2015 amendment, when and if it is cleared by the Joint Parliamentary Committee (JPC). Build a framework of PPP profit sharing, Centre-State funding, market bonds to raise funds for critical programs where funds from State is an issue – eg, metro programs, critical road widening. Remove the differentiation between agriculture vs non-agriculture, discrepancy in compensation – this is important if Bengaluru needs more satellite towns, industrial corridors and even NHAI corridors. Issue higher FAR ratio for someone surrendering more vs. less; empty plot vs. constructed land discrepancy has to be addressed. Else more objections will keep coming. Land lease policy and a framework around its primary usage for agricultural land would go a long way when Government talks of setting up Industrial Corridors. Unless you are able to address this, no progress but only announcements will be there. E-Governance, technologies like blockchain, geo-fencing and geocoding should be used to ensure validity of land records, make it public and transparent for more reliable process frameworks. Incentivise TDR owners on discounted land tax on their existing FAR, after surrendering the part of land. Option of monthly compensation for commercials for a span of two-three years for their rehabilitation, preference to allot them a government trade complex with preferential rentals/lease options. What does TDR mean, in terms of elevated corridors? In the above context, let us review the recently announced elevated corridor by Karnataka Government. I don’t want to get into the merits of the project. Let me instead focus on the core issue of land availability. As per the BBMP officials, they would need over 150+ acres of land and nobody is clear on how this will be implemented without clear plan and framework from the Government. This is the reason we need a policy framework that doesn’t make land acquisition look like an eviction or forcible grabbing of the land instead a more engaging, transparent, consultative policy driven framework, which is pragmatic. Monetary compensation is an important component to be addressed outside of other options. Flexibility in policy framework to make progress and ability of state government to work in PPP model, raise municipal bonds to fund for acquisition and also engage in lease model wherever applicable are all needed. Announcement of programs, allocation of funds to projects in every budget just adds to list of ‘to-dos’ without anything concrete development on ground. Instead, we need to fix the existing bills, pass structural and progressive reform policy framework to make the process of land acquisition more reliable, transparent and non-retrospective. This will ensure more FDI inflows, domestic investment and job market also going. A ripple effect due to this may also stimulate private capex cycle which could be a catalyst of growth revival. This would in turn help an economy uptick with earnings, hence more expenditure and discretionary spending. Unless we do this, we may not emulatr the growth pace of other states like Maharashtra, Tamilnadu in the space of Manufacturing and Industrial growth. However, many states are using this in adhoc manner that is creating more issues as intent is missing. We will have to wait and watch if the new Karnataka Government has the intent or ? Note: Members of Kasavanahalli Development Forum compiled the data shared in this article, while debating about the development projects stalled in the Bellandur region. All credit to data collated, graphs and pictorial representations are declared by author to the best of his knowledge. Reach out to the team at kasavanahallidevforum (at) gmail (dot) com for more. Note: The opinion expressed here are author’s own. June 16th is designated as International Domestic Workers Day. While they play a vital role in most middle and upper class families, most domestic help continue to work on the fringes of society. Are we on the right path, I wondered as I saw this scene in Lalbagh Botanical Gardens.